Find out what is happening in the City of Clovis by downloading the new Clovis PD App. The app was designed to bring the resources of the police department into the palm of your hand. 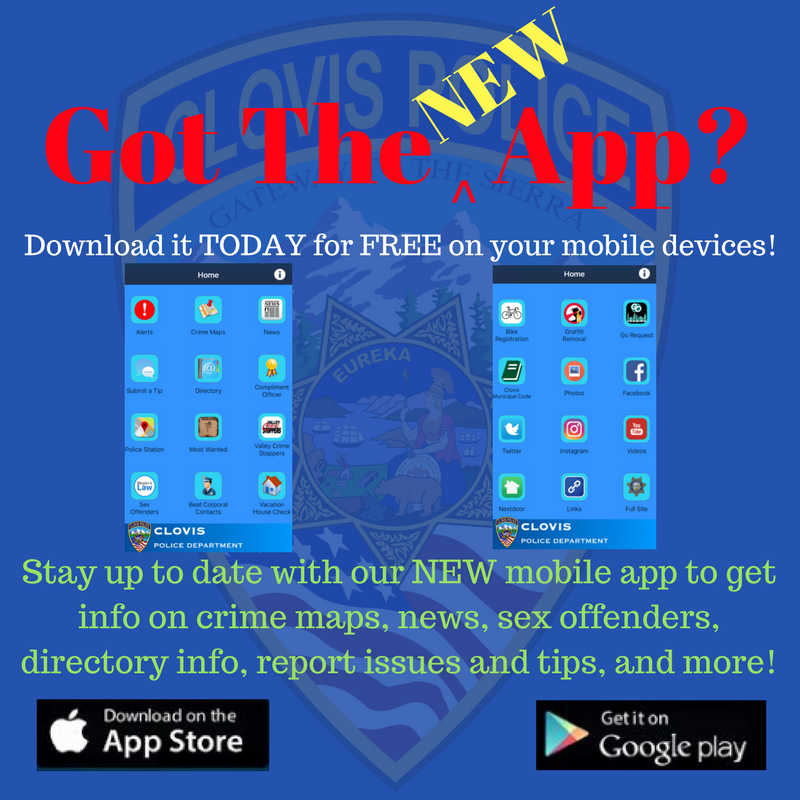 This app features crime maps, Clovis Police Department news, allows you to submit a tip, and has links to all of our popular social sites like Facebook, Twitter, and Nextdoor! The police department is committed to maintaining an interactive connection with our community. We hope that this mobile application will assist in keeping our citizens safe, and continue to keep Clovis the Safest City in the Valley. Alerts: Opt to receive instant push notifications for urgent situations and emergencies such as missing children, natural disasters, and important community safety messages. Crime Maps: Quickly and easily search crime and events occurring in your neighborhood. News: Keep in touch with press releases and events occurring within the city and police department. Submit a Tip: Submit tips relating to crimes or traffic problems occurring within the city. Tips can be submitted anonymously. Social Media: Access Clovis Police Department social media accounts such as Facebook, Twitter, and Nextdoor from within the app. Request: graffiti removal, vacation house checks, and register your bicycle.